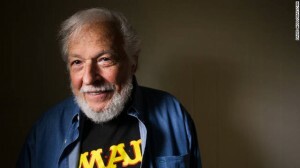 Word is spreading of the sudden passing of Nick Meglin, an insufficiently celebrated but extraordinarily important influence on American culture and cartooning. Nick is close to the last survivor of the offices of E.C. Comics (hang in there, Marie and Angelo!) and one of the legendary Fleagle Gang of young creative turks that moved through there and the streets of New York in the ’50s. But his real impact came after the death of titles like IMPACT, when E.C. shifted to make MAD a magazine and its legacy to the world. Nick became part of the editorial team when Al Feldstein took over as editor from founding editor Harvey Kurtzman, and stayed with the magazine for close to 50 years. For the first half of that time, Nick was on the masthead as Associate Editor, but the people who worked in the Usual Gang of Idiots identified him consistently as the biggest advocate for the creative talent working on the magazine. Many also felt that there was a period (coincidentally or not, during the time when MAD was at its peak, and one of the most successful magazines of any kind in America) when Nick was the man most putting the funny in. On Feldstein’s retirement in 1980, Nick and John Ficarra became co-editors, a seamless team that led the magazine for the next 24 years. Each had their talents, and their quirks (archeologists are still talking about the dig required to identify the artifacts found in Nick’s office), but together they kept MAD vibrant through many shifts in the culture. Nick wrote a number of the MAD paperbacks, and was particularly notorious for his skill at the song parodies that were embedded in so many of MAD‘s film and tv satires. Besides his work at MAD, Nick was a serious analyst of cartooning and humorous illustration, with a shelf of smart books on the subject to his credit. He took joy in his activity with the National Cartoonists Society, and fittingly, passed just a week after attending their annual Rueben Awards events. It was a sudden and swift passing for a man who enjoyed twist endings and surprising his readers, but if he succeeded in doing that one last time, he failed in that we’re not laughing this time, but crying. Farewell to a friend and an inspiration, and to the Stuyvesant High School alum who did the most to entertain a couple of generations that followed him there and elsewhere. Nick Meglin, renowned humorist and editor, passed away suddenly of a heart attack on June 2, 2018 at the age of 82. Paul Levitz has written over 300 stories with sales of exceeding 25 million copies, and translations into over 20 languages. Levitz is primarily known for his work for DC Comics, where he was the youngest assistant editor in the company’s history, wrote stories for almost all of their classic characters, served as President & Publisher from 2002-2009, and everything in between. He continues as a Contributing Editor, but now spends his time concentrating on his writing. He received Comic-con International’s Inkpot Award in 2002 and the prestigious Bob Clampett Humanitarian Award in 2008. Levitz also serves on the board of the Comic Book Legal Defense Fund, and teaches prestigious classes about comic books and publishing at several different universities, including Pace and Columbia.